Oregon courts rely on mediators in many contexts. Mediation helps reduce the burden on judges, because it reduces the number of trials at all levels, from small claims court to the Court of Appeals. During this recession, slashed budgets caused the courts to reduce employees, hundreds of them, from low-level staff to unelected “Pro-Tem Judges.” As a result, the increased use of mediation has proved critical to a well-functioning court system. Mediation benefits people, too. Mediation can offer solutions that a trial just cannot provide. In trial, there’s at least one loser, and sometimes, both parties lose. When the parties control their outcome, they often resolve issues in a way that works better than a judgment, which, after all, is just a piece of paper that the winner must then try to enforce. 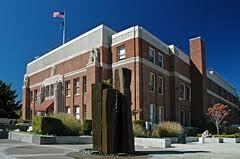 Clackamas County recently began its pilot project for mediating small claims court cases. Under the program, the court directs 50% of small claims cases to mediation. If the parties settle, great. If not, they can have their “day” in court. Well, not really a day – more like 10 minutes, according to Judge Darling. In reality, “small claims” are not so small. People can sue for up to $10,000 without a lawyer in small claims court. My Lake Oswego office is in Clackamas County, and I’ve volunteered to serve as a mediator for this six-month program. The county department for Resolution Services is doing an excellent job running the program. First, it provided an all-day training for volunteer mediators. Then, once per month, it provides an evening session to discuss the program and work on mediation techniques. After each mediation, program leaders gather the volunteer mediators to discuss what happened that day in order to improve the program and to coach the volunteers. Volunteers range from master’s degree students trying to get experience, to a retired mediator / lawyer in his 70s who wants to serve his community. Last week, my mediation involved a very interesting situation. Confidentiality prevents me from discussing the details. But, it was clear that the lawsuit for $10,000 was just one part of many parts of the problems between these two parties. For them, mediation truly offered them the best way to get their issues resolved and move on with their lives. 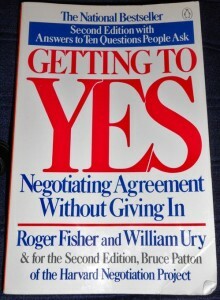 Last week, I wrote about a great book on negotiations. This week, I write about a terrible one. 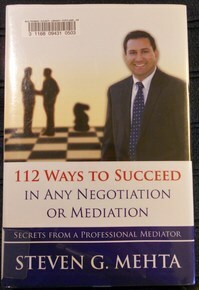 112 Ways to Succeed in Any Negotiation or Mediation: Secrets from a Professional Mediator is not worth 112 minutes of your time. It is not even worth 12 minutes of your time. Here’s one of those secrets that only a professional mediator could possibly know: “The secret to making the best opening offer, which allows the continuation of the negotiation process, is that there is no secret, just good judgment under the circumstances.” (p. 67). The book is a collection of seemingly random thoughts, 112 of them. (I guess; I did not actually count them.) The number gets so high because several of the thoughts are redundant or contradictory. One example of redundancy: on page seven, the author discusses the benefits of buying coffee or lunch for your opponent. On page 73, he urges readers to establish a friendly rapport with your opponent early by “giving a gift or doing a favor for someone[. ]” And how’s the following for providing guidance to negotiators? Let’s see if you can square the following bits of advice. (a) “Your competence in your field is an important source of power in your negotiation. Maximize that power.” (p.70) (b) “In negotiations, it never pays to reveal your true intelligence or your true position. It’s better to let the other side underestimate your skills.” (p. 83). Several of the tips are intended to be practical reminders. For example, the author reminds us to bring food and drink to a mediation session. Here’s a few more secrets that, perhaps, the author could add to the next edition. Tip number 113: Don’t forget to zip up your pants. Number 114: Show up on time. Number 115. . . When Impasse Occurs, Normalize it for the Parties. Last Friday, I enjoyed an all-day mediation training entitled, Impasse-Breaking and Ethics: Tips, Tricks, Traps and Tools, by Sam Imperati. Sam used his playful demeanor to keep us engaged while he worked through his points. He made many points, too many even to categorize in this blog post. The one point I will emphasize is this: normalize impasse. Sam articulates three points of impasse in a typical negotiation. The first is when neither party wants to be the first to present a realistic proposal: Plaintiff “demands” too much and defendant “offers” too little. Once both parties finally take the leap of faith into the realistic or “resolution zone,” then they, again, balk at getting to the narrower zone of where the deal will be struck. To illustrate this, Sam employed a grid that looks like a football sideline. Instead of numbers, he used letters from one “end zone” to the other of A through 0. The first impasse is the time when the parties hesitate to narrow the gap from between A and O to between C and M. Next, they stubbornly delay narrowing further to E and J. Finally, when they get to the true settlement range, which is between F and I, progress halts again. The third impasse is less about money than about who feels like the “winner” and who feels like she or he “conceded.” At this point, both parties have narrowed the gap so much that it would be irrational to let resolution slip away. However, as we all know, emotions control negotiations of many disputes more than does mathematical calculation. So, for me, of the 100 or so good points Mr. Imperati made during the day, MY take home point was (a) to counsel the parties to expect impasse, (b) let them know that what they are feeling is normal, and (c) then apply mediator tools to help them work through impasse toward resolution. 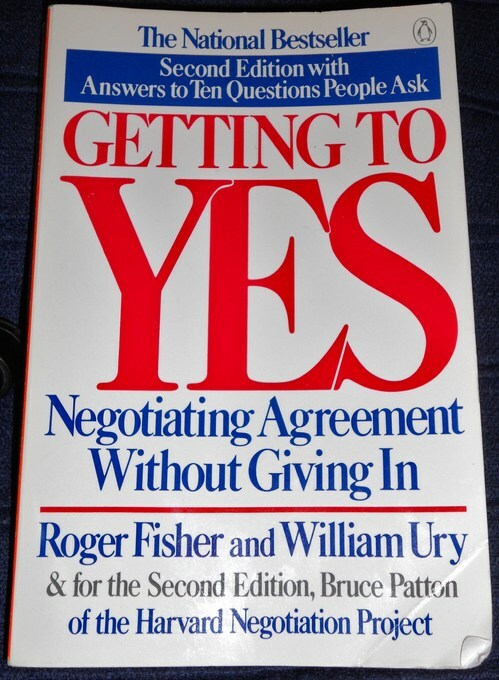 I found the classic book, Getting to Yes: Negotiating Agreement Without Giving In, on my bookshelf last week, and I read it again. Considering that less than 1% of civil lawsuits in Multnomah County, Oregon result in a trial by jury, every trial attorney needs to negotiate effectively. I have the second edition, written by Fisher, Ury and Patton of the Harvard Negotiation Project. This post highlights the key concepts in their approach. The authors urge negotiators to reject bargaining over “positions.” A “position” refers to a statement such as “I will take no less than $100.” If that is true and if the buyer cannot pay $100, then there is no point in negotiating. On the other hand, if the person – secretly – would take $60, then staking out the position of no less than $100 could prevent a favorable settlement, especially if the other person is prepared to pay up to $95. But if price seems to be the only thing over which to bargain, then what can negotiators do other than toss out numbers and try to bluff the other side as to the price they’d actually pay or accept? The authors set forth a four-part process. First, separate the people from the problem. We need to deal with both. The above “problem” to be solved could be stated as follows: “I’d like to sell this item, and you desire to buy it. How can we come up with an acceptable price.” However, If a negotiator stakes out a position such as “no less than $100,” then we need to deal with the issue of him defending his position and his integrity. In my law practice, we often need to address the real emotions of my clients for which there is no dollar value. The failure to address “people” and “problem” as real and separate issues can confuse the process and lead to failure or less-satisfactory results. Second, one needs to identify interests. At first glance, there seems to be nothing to discuss other than price: I want to pay less and you want to receive more. But further discussions might reveal other interests. For example, the buyer might not have more than $50 now, but will receive some money after he sells something. The seller might want to delay receipt of income until January 1. The buyer might need to spend money on shipping. The Seller might have regular delivery routes. By identifying interests, negotiators then move into the third phase of the method: invent options for mutual gain. In this example, the options become apparent: consider payments over time and discounted or free delivery. Nevertheless, there is still the issue of price. Here is where the authors insist on developing and using objective criteria instead of just talking tough. If the seller says, “It was my grandfathers, I cannot sell it for less than $100,” The buyer must refocus to, “I understand, but let’s determine what is a fair price for non-related people.” [I’ve used my own examples in this post, not the authors’.] Bargain over the process: how one can we determine a fair market value that we each might be able to accept. Try to get commitments on process. This avoids taking a position and then defending it. Agreeing on an objective process does not, necessarily, bind the parties to the result of the process, although that is a possible solution, too. The authors point out that the more negotiators can separate ego and feelings from an objective process, the better the chance of agreement. The authors acknowledge that not everyone wants to “play” their game of negotiating over principles instead of positions. 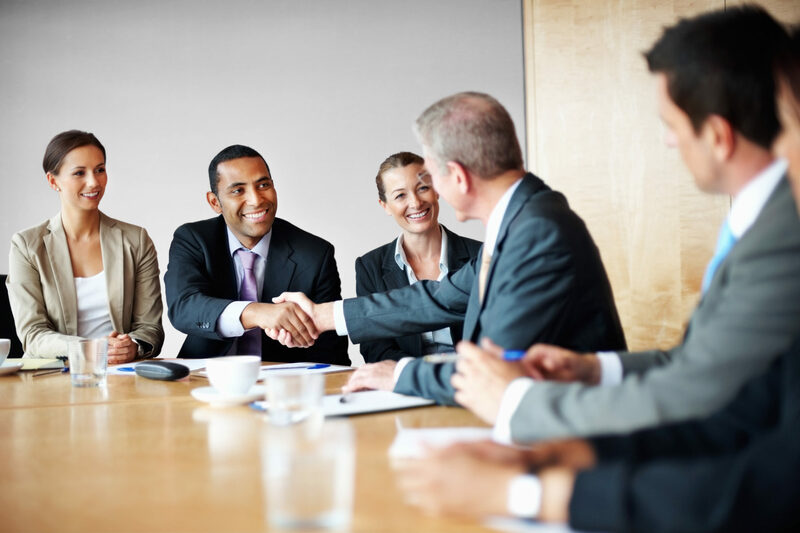 They discuss the concept of hard and soft negotiation and offer suggestions on how to deal with different situations. I’m glad I re-read the book. It is a good reminder of how to move negotiations forward when things bog down. Attorneys who represent people need to be especially well versed in negotiation tactics because most people have only negotiated car purchases. By contrast, insurance company claims adjusters negotiate all the time. Insurance companies know the tricks. Consequently, to achieve fair value for a claim, people need to make sure their own attorney is skilled at preparing for settlement discussions and negotiating. 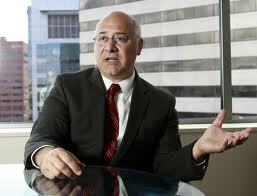 Brad Avakian is the Commissioner of Oregon’s Bureau of Labor and Industries. Yesterday, he shared with me and several other attorneys around a conference table what he’s doing to ensure BOLI does a better job of enforcing discrimination laws. Commissioner Avakian started with the statistics. BOLI receives 25,000 to 40,000 calls per year from people who believe they have suffered discrimination in employment or housing. 2,000 to 3,000 people file formal complaints. Of those formal complaints, BOLI finds substantial evidence of discrimination about 10% of the time. That means BOLI spends a lot of its scarce resources investigating the other 90%. So, Avakian’s goal is to (1) unburden innocent employers and landlords faster, (2) spend less agency time on the cases with no merit, and (3) fully investigate and prosecute cases of serious sexual harassment cases or other truly bad conduct of employers or landlords. Here’s the new program. Discrimination complaints will be categorized as A, B or C cases. “C” cases are the ones that seem to have no merit on their face. Instead of requiring the employer to prepare a formal response, BOLI will dismiss the case and issue a “right to sue letter.” The letter gives the accuser 90 days in which to file a lawsuit if the accuser thinks she has a case worth pursuing in court. “A” cases are those that BOLI believes are likely to have the most merit and will be investigated thoroughly. “B” cases will get more scrutiny than “C” cases, but might also be dismissed faster than the norm. Over the past several years, it seems like it takes about 11 months to resolve wrongful termination or other employment discrimination complaints. With the new system, some complaints will be resolved right away and others shortly after filing. This will benefit employers, who will not have to waste their time on cases with little apparent merit. It will benefit taxpayers, because BOLI will spend fewer tax dollars investigating crummy cases. But most important, the new system will help fulfill the goals of Oregon’s anti-discrimination law. More time will be spent enforcing the law against bad actors. Commissioner Avakian is doing what Republicans and Democrats should both like: he’s doing his job better with less money. Last week, a Portland, Oregon jury found that Les Schwab Tire Center should have paid assistant mangers overtime wages, and that these employees averaged 66 hours per week. The case illustrates that the job duties determine whether an employee gets overtime pay; it is not the job title or only whether they are paid a “salary.” The verdict determined the liability phase. Another phase of the trial will determine the dollar amount due. The final verdict will likely be multimillion dollars. considering the following. The decision could impact up to 200 workers, who averaged $4,000 per month in wages. For the additional 26 hours per week, Les Schwab will likely owe about $3,900 per month per employee. A court may double the wages due as a penalty, unless the employer can prove that it operated in good faith. Other penalties may be at stake, too. Plus, the employer will have to pay the attorney fees of the employees. EXECUTIVES and SUPERVISORS, who (1) direct the work of at least two employees, (2) play a big role in hiring and firing employees, (3) customarily exercise judgment or discretion, as compared to being told what to do, (4) management is their primary duty, AND (5) their salary exceeds a certain threshold. Apparently, the decision in Les Schawb had much to do with whether these “assistant managers” are primarily managers or mostly ran around changing tires. Also exempt are PROFESSIONAL EMPLOYEES, who must meet several tests. A partial list, includes (1) they perform work that requires advanced knowledge customarily acquired by a prolonged course of study, (2) perform work that requires invention, imagination, originality, etc., (3) teach in a school system, practice law, or medicine, and (4) their primary duties are the professional duties. Others who are exempt, include, (1) outside salespersons, (2) casual babysitters, (3) certain agricultural workers who meet the criteria, (4) seasonal employees summer camps for nonprofit organizations, or for profit businesses that gross less than $500,000. The above is just a partial list. For more information, the US Department of Labor publishes information on the Fair Labor Standards Act. Oregon’s Bureau of Labor and Industries publishes information on the Oregon’s Overtime Wage law. BOLI answers some overtime pay FAQs, too. This week, the Ninth Circuit Court of Appeals held that the whistleblower protection of Sarbanes-Oxley (SOX) does not protect leaks to the media. In Tides & Neumann v. The Boeing Company, employees Nicholas Tides and Mathew Neumann served as internal auditors for SOX compliance. They alleged pressure to rate internal SOX controls as “effective,” despite some concerns over some issues and expressed those concerns within the company. Then, a news reporter knocked on Mr. Neumann’s door. Company policy required referring any media inquiries to Boeing’s communication department. However, Mr. Neumann spoke the reporter and confirmed a draft of what she had written, despite knowing of the news-referral policy. Mr. Tides contacted the reporter, himself, after receiving his performance evaluation, and provided her information. Boeing discovered who the “whistleblowers” were and fired them. They filed suit under Sarbanes-Oxley whistleblower provisions. The Ninth Circuit felt this was an easy case. The SOX whistleblower section protects only disclosures to the following: (A) Federal regulatory or law enforcement agencies, (B) a Congress member or Congressional committee, and (C) the supervisor or other person working for the employer who has authority to deal with the misconduct. The list does not include blowing the whistle to the news media. Ninth Circuit FMLA Ruling: Oregon Worker May Win Lawsuit Without Proving Employer’s Bad Motive. Recently, the Ninth Circuit Court of Appeals resolved an important question in an Oregon case under the Family Medical Leave Act (FMLA). In Diane Sanders v. City of Newport, the city refused to reinstate Ms. Sanders after her doctors said she was fit for duty following her medical leave. Later, the city fired her, claiming that they could not guarantee a workplace that would not trigger her medical reaction to chemical sensitivities. The question was, Who had the burden of proof? Must the employee prove that the employer had no good reason to keep her off work? Or is the burden of proof on the employer to prove a lawful reason to avoid reinstatement after medical leave? Ms. Sanders alleged discrimination and interference with her rights under FMLA and under Oregon’s Family Medical Leave Act. The trial judge instructed the jury that the worker must prove that the employer, without reasonable cause, did not put her back to work. The Ninth Circuit held that the employee did not have to prove what was in the mind of the employer. Instead, all the employee needed to prove was (1) she qualified for FMLA rights, (2) she was entitled to leave, (3) she followed the rules for reinstatement, and (4) the employer did not provide the FMLA rights. If the employer has a legally-sufficient reason to avoid reinstating the employee, then the EMPLOYER has the burden to prove its good reason.